The long-term research goals in the Wu lab concern the genetic framework underlying nervous system function and behavior in the context of nature-nurture interactions. Our research involves analyses at difference levels in Drosophila with a combination of electrophysiological, anatomical, cell biological, genetic and behavioral techniques. Currently, our research topics center around neuronal, behavioral, and lifespan plasticity in Drosophila. We focus on mutants with altered nerve excitability and deficiencies in learning behavior. 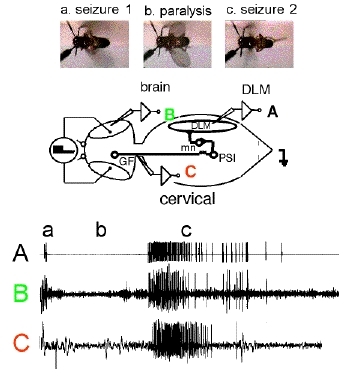 Identified neurons and neural circuits in mutants and transgenic flies are analyzed for synaptic and ion channel mechanisms underlying nerve activity patterns associated with distinct behavioral modifications. Genetic mosaics are also constructed to analyze the behavioral and physiological consequences of altering different parts of the neural circuits involved in specific behavioral tasks. These approaches also provide insights into developmental plasticity and homeostatic regulation under environmental stresses throughout the lifespan. A major emphasis of current research concerns the importance of social interactions in protecting against age-related functional decline and neurodegenerative disorders. We found that the short-lived Superoxide Dismutase (Sod) mutant flies could double their lifespan when co-housed with young, active “helper” flies of a different genotype. This co-housing also improves Sod flies’ stress resistance and motor coordination. We are investigating the nature of the interactions to unravel the underlying molecular mechanisms and networks of interacting genes that confer the beneficial effects. This page was last updated on Tuesday, March 10, 2015 - 10:51am. Please contact us at biology@uiowa.edu or 319-335-1050 if you need further information.